Noah Sylvester '18, a theatre business and psychology major from Calabasas, Calif., stands outside Augie’s Coffee House in downtown Redlands. (Photo by Taylor Matousek '18). Since its opening in 2009, Augie’s Coffee House in downtown Redlands has become a central meeting place for students and community members. Located just off of State Street on Fifth Street, the establishment caters to everyone from creatives who set up shop to work on their computers to passersby with strollers in tow. It’s also where a handful of University of Redlands students choose to study, offering a change of scenery and a home base off campus. 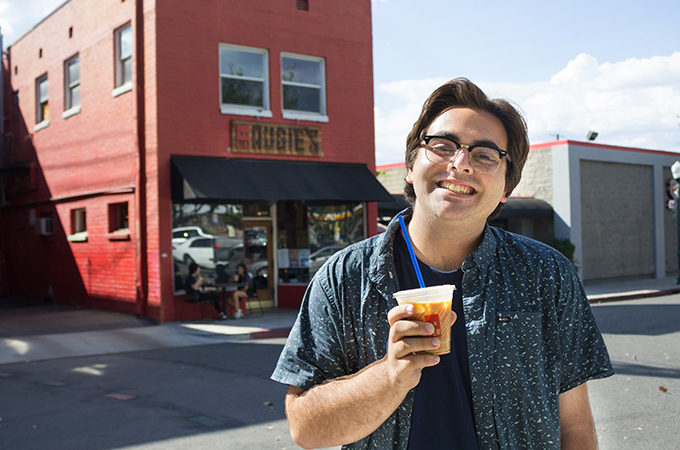 As far as coffee offerings go, Augie’s proffers a variety of beverages made by baristas who serve up recommendations depending on the season. During the summer, customers are encouraged to try the espresso tonic—a concoction of soda water with a shot of espresso floating on top. During the cooler months, baristas suggest a hot honey cinnamon latte. Iced caramel lattes are enjoyed all year round, thanks to the sweet caramel sauce sourced from Parliament Chocolate, a neighboring artisanal chocolatier. With a small roster of passionate employees, it’s easy for customers and baristas to get to know each other. Sylvester says that the baristas are one reason why he keeps coming back. “They make the shop feel like home; it’s such an inviting place,” he says. 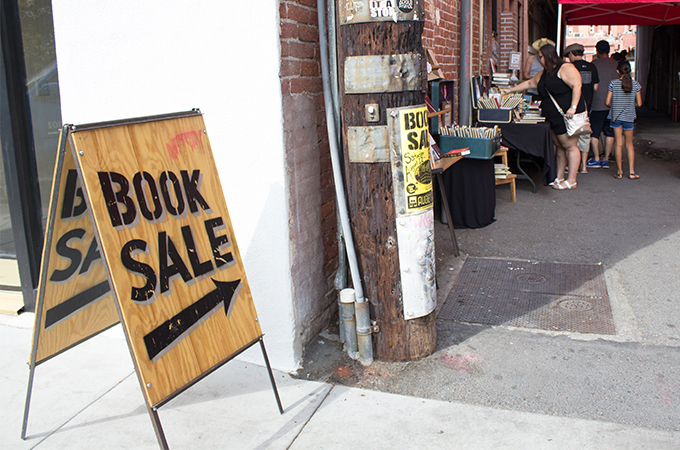 On the second Saturday of every month, Brown Bag Books, a traveling bookstore, sets up shop in the alley beside Augie's Coffee House. Augie’s serves as a hub for culture and the arts by hosting monthly art shows and participating in the downtown art walk, a festival that happens twice a year. On Monday nights, Augie’s hosts a group of jazz musicians, and patrons stop in on their way to or from Market Night, the large farmer’s market in downtown Redlands, on Thursdays. A smaller farmers’ market establishes itself in the parking lot across the street on Saturday mornings, supplemented by a book sale in the neighboring alley once a month.